Coral Cay Resort in Kissimmee is a gated townhome community set amidst lush tropical landscaping -- right in the heart of Kissimmee resort area! Coral Cay Resort gives people the chance to achieve the ideal balance of seclusion and access to everything Orlando has to offer. 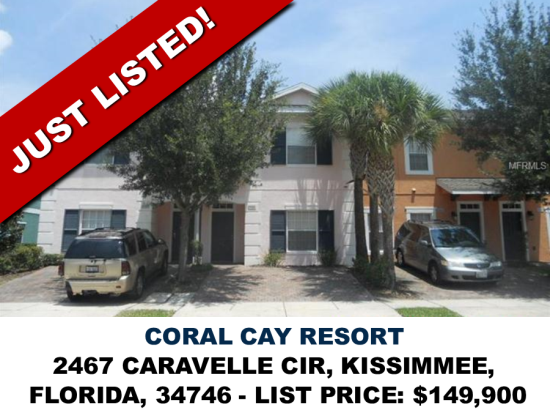 Situated less than five miles from Walt Disney World, Coral Cay Resort in Kissimmee is an ideal location to ...unwind and enjoy the excitement of the world's favorite vacation spot. Just minutes from Orlando's vast array of theme parks, this Kissimmee Resort offers nearby dining options and world-class shopping; The grounds of Coral Cay's town homes are a haven for vacationers seeking a secure, family-friendly environment to enjoy their stay. Walk away the afternoons with a leisurely stroll around the area's walking paths; stretch out with a good book while overlooking the fountain and lake in the center of our Kissimmee resort; catch a movie in the clubhouse theatre; and at the end of a long day of fun. The club house has free wi fi. There is play areas, a wadding pool, spa and jogging trail in the gated community. The unit has its own hot tub and is over looking water and the community pool and club house.